Hopefully no one will fool you today! 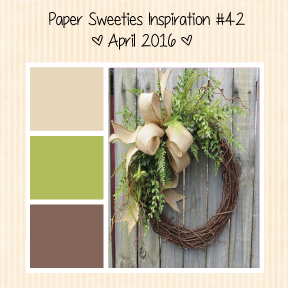 And I just LOVE the beautiful colors of this month's photo inspiration! I would love to have a wreath like this on my front door! Gorgeous! The colors made me think of Spring! I stamped the cute butterflies from the Bee Happy stamp set and colored them with Copic Markers. I fussy cut them out and popped them on a panel of green corrugated paper. I added black Liquid Pearl and Wink of Stella on the wings. And that fun sentiment is a SNEAK PEEK of this month's new releases here at PAPER SWEETIES! I just love the way the colors look together! What a lovely card with the pretty butterflies, Mackie! Love the corrugated paper, too! This is gorgeous! LOVING those butterflies!!!!!!!!!!! I love these fresh green butterflies, Mackie! This is so creative and fun! Lovely card, Mackie! 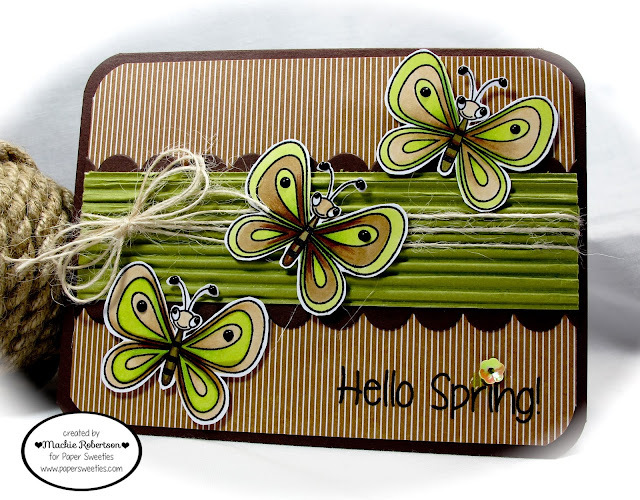 Those butterflies are just perfect for a spring card. Oh my, cute as can be Mackie! Love those bright and cheery butterflies and the amazing corrugated paper background you used!!! I, too, LOVE the corrugated paper and those FAB butterflies! Delightful card. Mackie! Mackie, I just ADORE your card!! Those butterflies look like they are just fluttering off your card! Absolutely beautiful, Mackie! Great color work, and I adore the textures! Pure cuteness Mackie! What a wonderful trio of fun butterflies! This is so so beautiful! !